I love living in a world in which breakfast cookies are a thing. Breakfast anything really – breakfast cookies, breakfast cake, breakfast PIZZA. What a time to be alive, friends. I’m glad we’ve all found a way to make cookies for breakfast a socially acceptable thing. I mean – I’d still eat them anyways. I’ve never been one to discriminate against any type of cookie at any time of day. I’m just glad we can all agree on cookies. 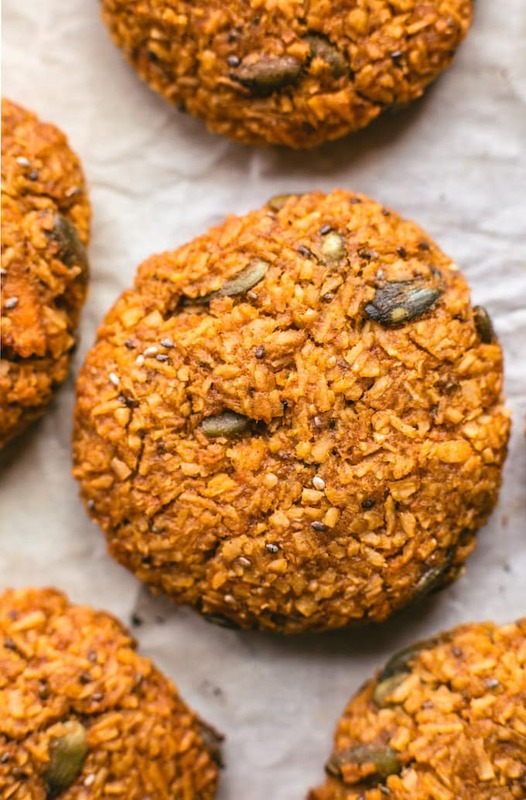 Now let’s chat about these Sweet Potato Breakfast Cookies aka your new favourite breakfast cookies. As I mentioned above these cookies are super easy to make – made in one bowl and ready in less than 30 minutes! 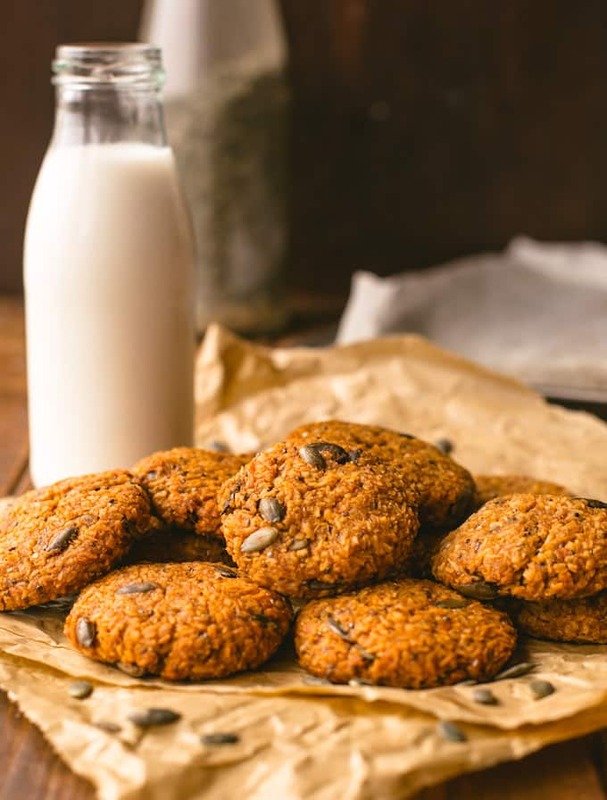 Unlike most breakfast cookies these are oat free which is great for all your coeliac’s who still have to be wary about eating even certified gluten free oats. 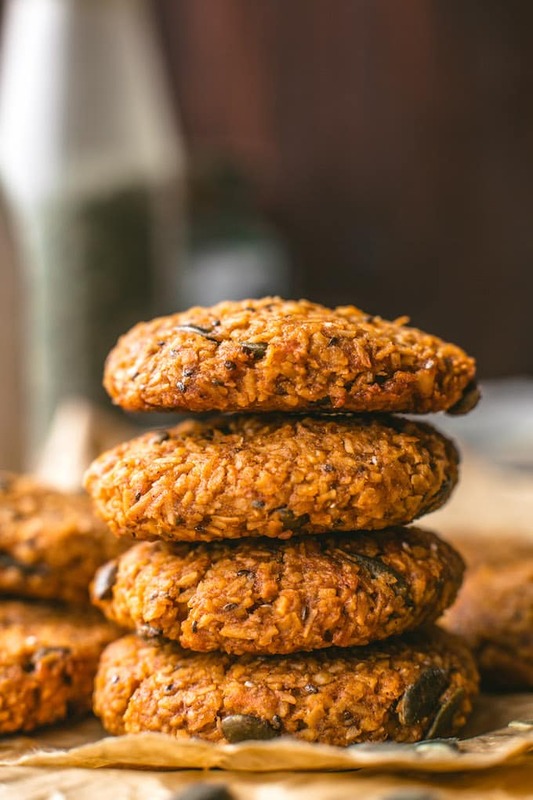 Instead of relying on rolled oats for the bulk & texture in these cookies we’re working with desiccated/shredded coconut and a mixture of a few different seeds. At the very base of this recipe is mashed sweet potato. The sweet potato adds bulk, sweetness, and extra nutrition. It also means that we don’t need as much oil/fat as most cookies recipes do. In order to get the mashed sweet potato – there are a couple of ways you can go about it. Option 1 (fast way): Poke a sweet potato all over with a fork and then microwave for about 4-5 minutes until soft and tender. Large sweet potatoes will need more time than small potatoes. Once microwaved, let cool for about 10 minutes before handling and the slice the potato down the middle and scoop out the insides. The peel should easily come off at this point. Then just use a fork or potato masher to mash until smooth. Option 2 (long way): Poke a sweet potato all over with a fork and then bake in the oven for 45-60 minutes at 400°F/205°C. Remove from the oven and let cool for about 10 minutes before handling. Slice down the centre of the potato and scoop out the insides. Use a fork or potato masher and mash until smooth. I haven’t tried these with bananas yet, but I’m fairly confident that you can use that if you prefer. Pumpkin is another substitute that should work. I’ve got another few weeks before the canned pumpkin should start showing up on store shelves here. Once they come back I’m going to be in full fall mode making these every chance I get! All in all these cookies are simple, tasty, and dare I say good for you! They’re great if you want a grab and go snack to start your day, or something a little sweet to go along with your coffee or tea. However you eat these – I just hope you enjoy them as much as we do! Don’t forget to #asaucykitchen on instagram if you try these Paleo Breakfast Cookies! I’d love to see what you make with it! You can also post your pictures to my facebook page! Preheat oven to 350°F/175°C and line or grease a large baking sheet. Combine 1 tablespoon ground flax seed (or chia seeds) with 3 tablespoons cold water. Whisk until combined and place in the fridge for at least 5 minutes while you prep the cookies. When the 'egg' has thickened and gelled up it's ready to use. In a large mixing bowl with an electric or stand mixer - beat together the mashed sweet potato and coconut sugar. Stir in the melted coconut oil and combine. Beat in the flax egg until combined. Scoop the cookie dough out about 2 tablespoons at a time. Roll into little balls and then flatten out on the tray. The cookies won't spread while baking so shape them as you like. Bake in the oven for 12-15 minutes or until the edges are lightly golden. Let cool on the baking tray for about 5 minutes before transferring the a cooling rack to cool completely. Keep these stored in an airtight container for 4-5 days. I just tried these cookies and absolutely love them! I used a light olive oil instead of the coconut oil and brown sugar in place of the coconut sugar. They are sublime. Thanks so much. Yay! So glad you liked them! Thanks so much for coming back to let me know what you thought! Yay! So glad you enjoyed them! Thanks for coming back to share! Could you recommend a substitute for the coconut oil please? Can honey be used instead of coconut sugar? Hi K! Sorry to hear that! 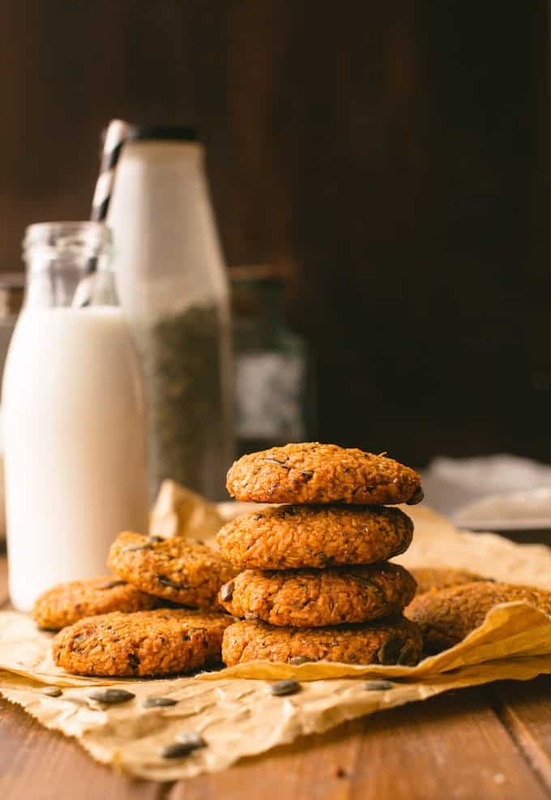 I’d recommend using the full coconut of amount next time – thats what makes up the bulk of the recipe and not using all the coconut is like not using the full amount of flour in a regular chocolate chip cookie recipe. Hope it at least tasted alright! Can you use an egg instead of the flax egg? I’m not vegan. 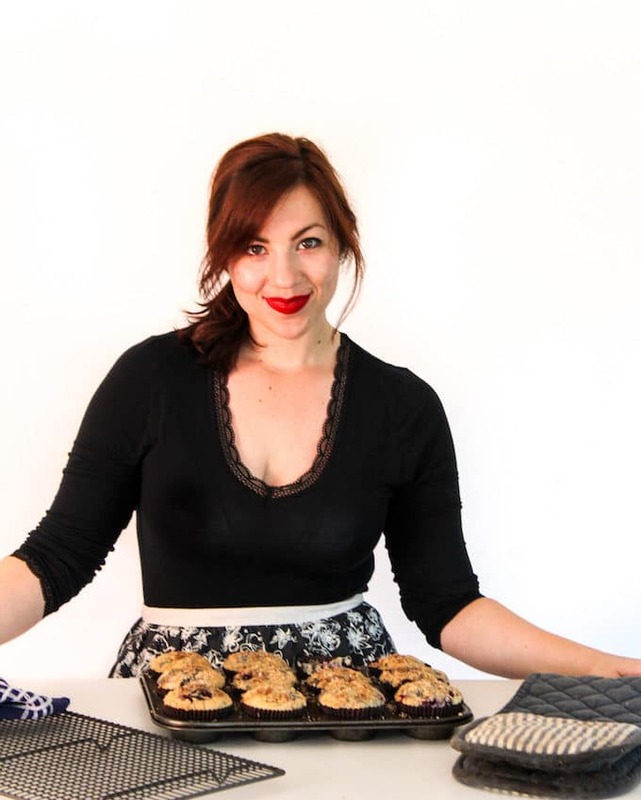 Hi Rebecca – I haven’t tried these with a flax egg so I’m not sure yet how they would work. If you do try it out please let me know! I used 1 egg and omitted the chia seeds. If you do this, I would suggest a little more coconut maybe. I had to cook mine a touch longer. They are still really yummy though! I also threw them once cooled into the freezer. A cool treat for the warm days we’ve had. Thanks for sharing that Kay! So glad you liked them! Hi Sarah, what would you suggest to substitute the desiccated coconut? Since so much is added, would leaving it out altogether affect the mold or texture of the cookie? Thanks! Are there nutritional values posted somewhere? Without a doubt these look absolutely delicious and really thick. It seems like one of those cookies could serve as breakfast as look to be really dense. Thanks for sharing this. Hi Jenn! It might be easier for you to plug in the ingredients to myfitnesspal so that you can customise it with exactly what you’re using. Since you’re not adding in a couple of ingredients you might need to increase other amounts so this will give you the most accurate measurement for what you’re using. Hope that helps!